The countdown to summer camp has begun! Now that you have your camp booked, the next step is to packing your bags! For our teen campers, this may be the first time that you have travelled this far away from home on your own, and our goal is to make this trip as easy and FUN as possible (and that includes bringing all the right gear!). And for our women’s camp, it may have been a few summers since you’ve been to camp, and may be time for a refresher! Here’s your definitive guide to CAMP PACKING! hang out in the monkey tree with your hammock! 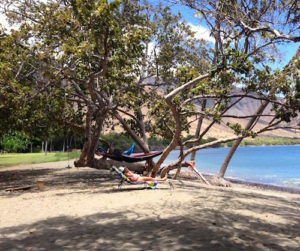 Pack a Hammock! At camp we have an awesome monkey tree where there is space for multiple hammocks. Bring yours to join the monkey family. Choose a great book to bring to enjoy down time while reading in the hammock. Can’t decide which book to bring you can always trade with someone else at camp. Not much into reading, meditative coloring books are all the rage! Find a multitude of fun options at your local book store. Bring a talent! We have a talent share night at camp where we love to show case campers amazing talents! Start thinking about what you might share. If you don’t feel like you have any talent you may just discover yours at camp. And a pair of Running shoes! If you want to stay in shape (not that camp isn’t active enough) bring some work out clothes. Morning runs can be arranged for the dedicated running enthusiast. And we’ll always have a workout of the day for anyone that needs more challenge in the already tiring camp schedule! Plus, we’ll have a camp store with some fun MSG merchandise, so we’ll keep you covered if there’s anything you forget! 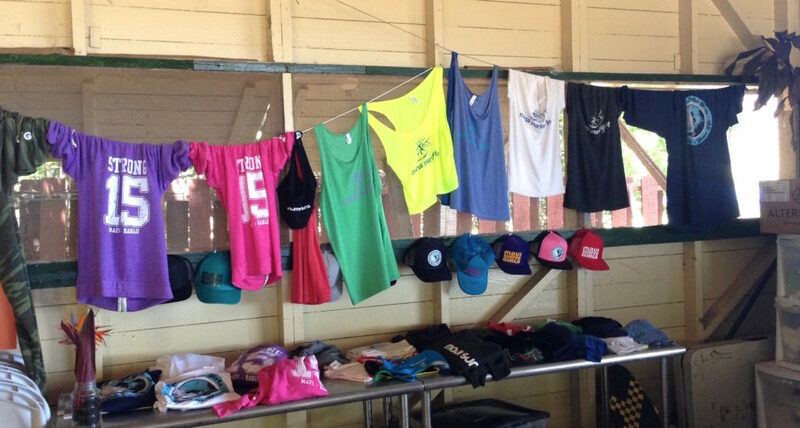 Stock up on t-shirts, hats, rash guards and more at our Camp Store! Next on the list: REEF SAFE SUNSCREEN! Save the earth! We all know that. Need ideas? Visit Jtreelife.com for natural and organic skin care products that reduce our footprint and are healthier for your skin anyways. And finally, A sarong. Lightweight material takes up less room in your suitcase, makes for a great towel, makes it easy for you to change in and out of your suit at the beach, and dries super fast. Not only that but it looks pretty for decorating in your cabin!If you don’t have a sarong, there are plenty of great ones to find all around Maui! When packing for an overnight, camp, or a year long trip… I pack just a backpack. In the backpack is 3 bathing suits, 2 shorts, one pants, one dress, and three t-shirts, 7 underwear. I always include a journal because life is about experiences not materials, and journals help you remember these moments. Materials have nothing to with your presence being at a place at a certain time… its destiny that brings us all together and so its your personality that will shine the most in any given situation. I believe that the more clothes and materials people travel with, it only slows them down, makes them over think their appearance. 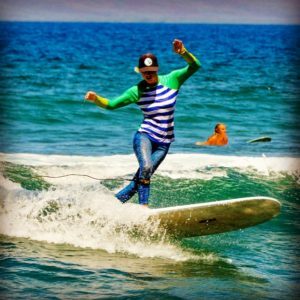 Kelly Potts models some surf pants and a rash guard. Mahalo to her sponsor prAna! 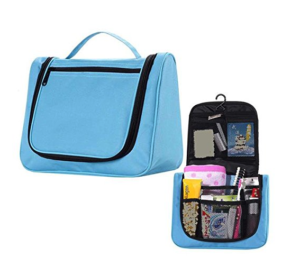 This cute toiletry bag is perfect for carrying between your cabin and the showers! Please PACK LIGHTLY, the more you pack the more you keep track of!! back up sunglasses, towels, stuff you usually lose. IF YOU FORGET ANYTHING, ESPECIALLY SUNBLOCK OR SWIMSUITS, THERE WILL BE SHOPPING OPPORTUNITIES FOR THE ESSENTIALS. Please pack lightly, less is more at surf camp! *There are laundry facilities available. Our coin operated machine is 1.00/load! ** Spending Money: We’ll be doing a shopping trip to Lahaina and we’ll have a camp store with MSG merchandise. So plan at least $150 to spend (depending on how many weeks you are attending).! ***We provide surfboards & have them for sale in our camp store, but by all means bring your own if you have one.! ****We provide a bottom sheet for all campers, but all other bedding (blankets, pillows or sheets) must be provided from you. The nights can get cool enough that light blanket is nice. We should never forget sunscreen! Also hydrating is important so it’s ideal to pack a water bottle.